Smiling with confidence makes you feel great and is the first thing that people notice about you. A beautiful smile is also an important social and professional asset. Yet there are many who avoid showing their teeth in photographs and public because they have stained teeth. If that describes you then why not start the process of getting a beautiful smile you’ve always wanted with teeth whitening treatment in Mohali. You may be tempted to hide your mouth when you laugh or smile if you have stained teeth. 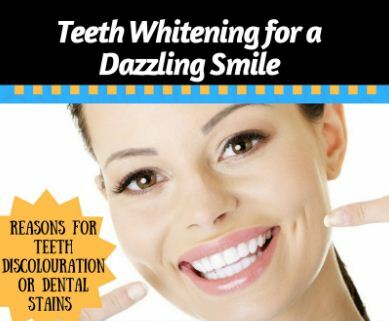 Teeth whitening procedures can transform your teeth from discoloured shades to bright white quickly and easily. Tooth whitening is either restoration of natural tooth shade or whitening beyond the natural shade of the tooth. Scaling is a non-surgical, conventional periodontal therapy or deep cleaning process. It is used for removal of etiological agents such as dental plaque and calculus which causes teeth discolouration. It is done to remove stains from the teeth and smooth out the tooth surface which makes it difficult for the plaque to accumulate. Hence there is no staining in teeth. 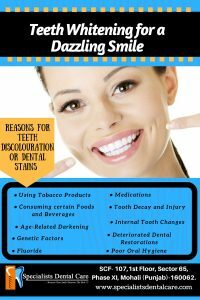 Bleaching is done to restore natural tooth shade. It includes techniques used by dental professionals and the method which the individual can do at home. The treatment supplement is either provided by a dental professional or can be bought from a chemist. This treatment involves isolation of soft tissue with a resin based barrier. Then a dental grade hydrogen peroxide whitening gel is applied and exposed to the light source for 10 to 15 minutes to whiten teeth. Dentifrices are agents used with a toothbrush to clean and polish teeth to make them whiter. They are supplied in the paste, powder, gel or liquid form. Unlike bleaching agents, dentifrices do not alter the intrinsic discolouration of teeth. Laminates and veneers are an ultimate option of teeth whitening. They are thin slivers of ceramic, porcelain or a composite substance, which is carefully cut and shaped to match the existing teeth and then permanently bonded on tooth enamel. They are long-lasting if properly maintained. Whether you’re looking to cover up minor dental damage or want a safe and effective method of teeth whitening, then the above methods are for you. Visit a teeth alignment specialist in Mohali and get the smile you have been dreaming of! By maintaining proper oral and dental hygiene and professional cleanings, you can preserve your bright and beautiful smile. For more info and check-up, get in touch with Specialists Dental Care.